Amidst the sounds of the rain lashing against Lakshmi Kutty’s Amma’s tin roof, a battery-powered radio plays romantic Malayalam songs. The smell of freshly-sambar sambhar wafts into the big room with small windows that holds a fireplace. This big room has no doors; it is a room made of mud with a thatched roof where Amma (as Lakshmi Kutty is known) sleeps and roasts yams on the woodfire. On most nights, the only sounds she hears are of crickets or frogs in the rain. On other nights, the distant thuds from banging pounding of drums and dull fireworks to scare off wild boars and elephants in the distance punctuates her silence. Amma has spent her entire life in the dense forests of the Ponmudi Hills, home to the Kani tribe to which she belongs. For the last several years, Amma has lived alone. One of Amma’s sons died of a heart attack, another was killed by an elephant, and her husband passed away soon after from the pain of losing two sons, some say. Her days are spent working around the house and attending to the occasional patient who almost always shows up unannounced. They usually look unsure trudging along the dirt path towards Amma’s home but a small hand-painted sign hanging from a tree stating Amma’s expertise is assuring. They appear surprised at where they’ve found themselves, and at Amma’s life. They appear to be further surprised when she opens the doors to her lone, wooden closet and scours through a hundred unlabelled bottles to whip up a concoction of oils and ointments. The trees are very tall and the jungle is dense in these forests. Medicinal plants grow in a small, wild patch behind her kitchen. Next to her house, a small enclosure made of tin holds her religious idols and offerings. 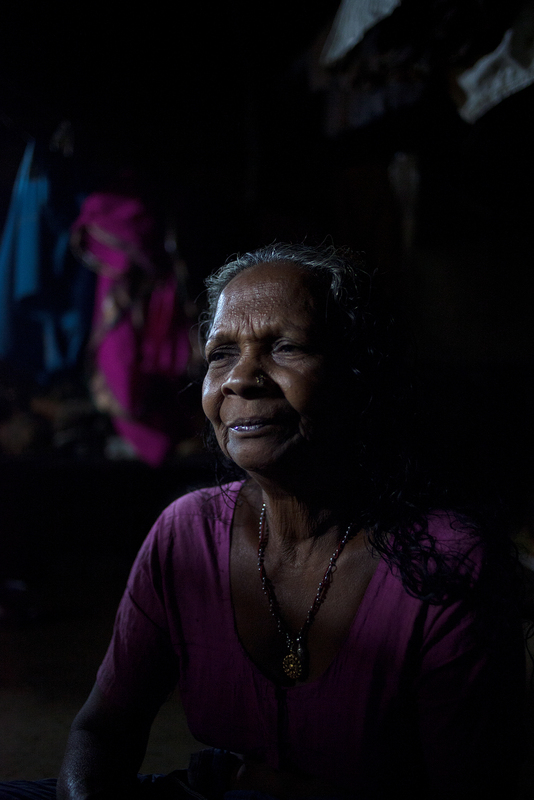 Half of her home remains unfinished because Amma ran out of money while building it. She speaks fondly of the days when the Kingdom of Travancore ruled these parts, of when the King himself would show up to enquire about her tribe. She is unhappy that no one from the government today comes to ask her how she’s doing. Her poems reflect the society that transformed around her: the road that was never built, the man who drank too much alcohol, and the changing history of Kerala. It surprised everyone that Amma managed to stretch a few childhood years of education into a blossoming love for poetry and writing. Everyone in Ponmudi knows Lakshmi Kutty, they also know her as the herbal doctor and poison healer, as a poet and as the 74-year-old woman who lives alone. Forty-four years of treating patients using natural medicine and several decades of writing poetry has made Amma a diligent list-maker; 514 patients treated for everything from cholesterol to cancer and over 300 people treated for poisonous snake, scorpion, and spider bites to be precise. Every patient she has treated finds mention in her diaries. On days when we walked through the forest, past glittering, clear streams, Amma warned us about the perils of bathing too late or eating too early, about the waste we produced or the unnecessary things we consume. There was a lesson in everything Amma did and said; metaphors, humour, and rhyme found a way into her everyday humdrum of life. When she switches on the radio again at night and settles in to write poetry on her wobbly desk, her cats, Kunjan and Kunji, keep warm near the fire. Amma sings aloud her old poems, her voice competing with the croaking of the friendly frogs and the static of the daily news as another lonely night falls in the Ponmudi Hills.